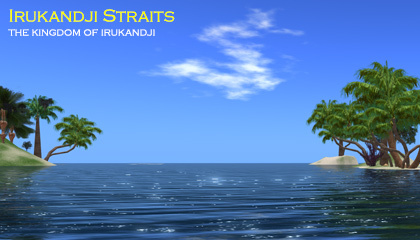 Located in Central Irukandji, Irukandji Straits was a deepwater sailing sea on the InWorldz virtual world grid during 2014. A deepwater sea and thoroughfare between Aboyo Island and Old Fort Island, its western shore abutted Irukandji's capital, Tamita Island. Consisting entirely of water, its visual appearance was unremarkable, however the view from the sea of the surrounding sims was quite breathtaking. Irukandji Straits was an unintentional sim, or I guess a reactionary sim, in that it had existed in a previous form, Lagune d'Or for quite some time before its inception, but I was forced to change it. 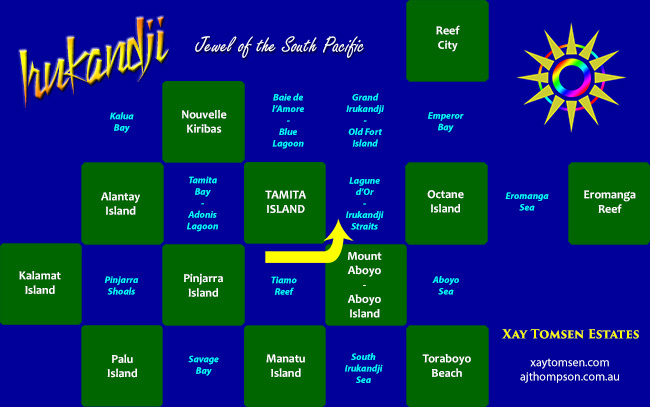 In mid 2014, with Tamita Island becoming densely commercial, coupled with the addition of a new residential sim, Aboyo Island, directly south of it, Lagune d'Or needed to be changed. The effort was largely in vain though and the life span of Irukandji Straits relatively short, as I was nearing the end of my time as a continent builder in InWorldz. I am glad, however, that I changed its name so as to underline the past and preserve its previous history. As a result, while many people enjoyed using the bay to the east of Irukandji's capital, most will remember it as the pretty sandbar-strewn bay, Lagune d'Or, rather than the deepwater sealane, Irukandji Straits.